Bibb Mill No. 1 in Macon, GA, 1909. 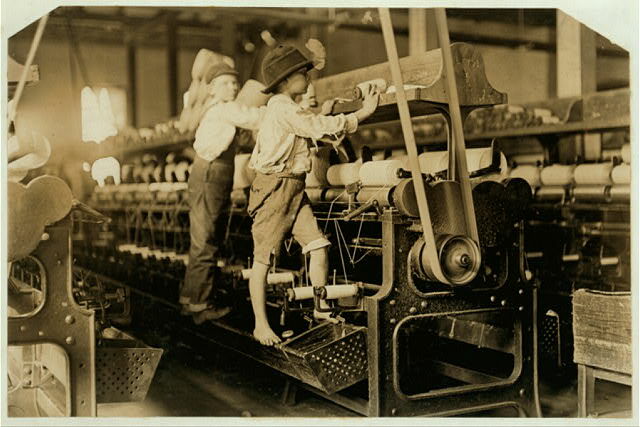 “Some boys were so small they had to climb up on the spinning frame to mend the broken threads and put back the empty bobbins.” Lewis W. Hine (1874-1940). Library of Congress Prints and Photographs Division. 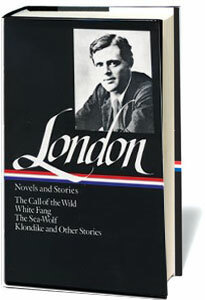 Jack London worked a number of odd jobs during his childhood years in West Oakland, California: delivering newspapers, sweeping salon floors, and setting up pins in a bowling alley. After he completed grammar school in 1890 at the age of fourteen, he found employment at the nearby Hickmott’s cannery, where he spent twelve to eighteen hours a day stuffing pickles into jars—at ten cents an hour. The work was strenuous, tedious, and robotic, and the long hours kept the teenager from his favorite pastime: reading in the local library. As Alex Kershaw notes in his biography of London, “There had been no attempt to outlaw child labor in California, nor was there health and safety regulation, nor any limits on hours worked.” Toward the end of the century, some states began passing laws prohibiting factory and quarry work for children under fourteen, but evasion was widespread and enforcement was spotty. At the age of eighteen, he abandoned the ranks of the working poor, adopted the mien of a hobo, and joined Kelly’s Army, the western branch of Coxey’s Army—a national movement of so-called “tramps” who marched to Washington in protest. (See our introduction to Stephen Crane’s “An Experiment in Misery,” a previous Story of the Week selection, for more on Coxey’s Army.) London made it only as far as Hannibal, Missouri; he was eventually arrested for vagrancy and sentenced to thirty days in a New York penitentiary. Twelve years later, in 1906, his life had turned around spectacularly and he used his nightmarish adolescent adventures as the basis for “The Apostate,” which originally carried the subtitle “A Child Labor Parable.” He had become one of the highest paid writers in the world; Woman’s Home Companion paid him $767.30 for this 7,673-word story. As The World of Jack London website points out, the boy who once toiled for ten cents an hour was now a young man earning ten cents a word. “If you don't git up, Johnny, I won't give you a bite to eat!” . . . If you don't see the full story below, click here (PDF) or click here (Google Docs) to read it—free! "But by the end of 1993, London was back working ten hours a day,..."
I noticed a typo, and should read 1893. The horrors of child labor...I am totally blown away by this story. I need to read more of Mr. London's work. I just read this very sad and upsetting story. What a complete turnaround we have in the US today! Hardly a child in this country knows what work is -- not even how to clean up their bedrooms or help around the house at all! Jack London is one of my favorite writers and I didn't know he wrote muckraking stories, althought I knew he was a socialist. My favorite story by Jack London will always be "To Build a Fire," but this one comes close! A moving story to be sure but it also stumps me. Lonodon's life was, at times, as broodish as Johnny's but such were the times. I can not for the life of me explain however how and why we were a more literate society then than today Then there many more newspapers, different types of printed publications from the unions, religious and political and for all strata of society.